Features •Play with genuine wood against your favorite chess program or internet opponent. • Broadcast chess games live over the internet. Ideal for tournament presentation. 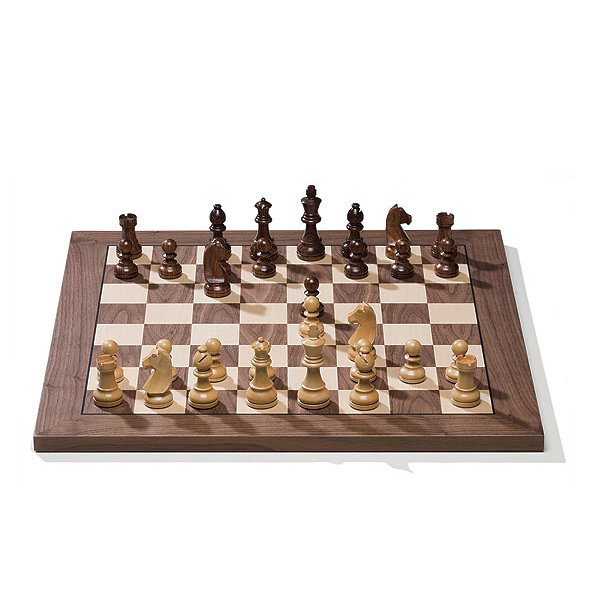 • Beautifully inlaid wood board with official FIDE tournament-size squares (5.5 x 5.5 cm). • Boards are only 1.8 cm thick, same as a normal chessboard. • Classic Staunton wooden chess pieces with a king height of 95mm (3.75"). • Possibility to connect a DGT XL Clock (opponent�s moves are shown on the clock's display). • Modern and reliable sensor technology recognizes each piece accurately and fast. • Each individual piece is identified by colour and type. This gives you extra reliability in fast blitz games and makes setting up chess positions very easy. • Internal memory (for 500 moves). • Simply connects to the USB port of your PC. • Driver CD included for Windows XP/Vista/7 (32 and 64 bit). • Supported by many existing chess programs. Click here to see a list of these programs. • Drivers and other board software can be found on our DGT Software webpage. •Overall Board Dimensions: 21 1/4" x 21 1/4"